The NHLPA has released the results of their annual player poll to questions ranging from who is the best forward, to most underrated player to best referee. Out of the 31 NHL teams, Bell MTS Place ranked in the top five in three categories. 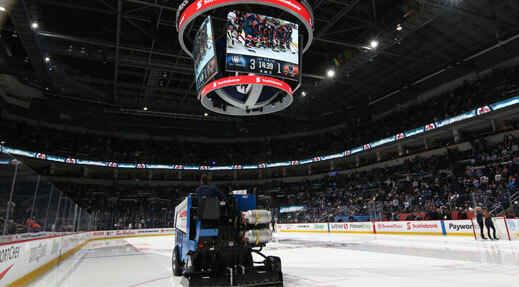 If you have attended a Winnipeg Jets home game, you might expect Winnipeg to have scored top marks for noise, passion and overall atmosphere. Bell MTS Place certainly scored well in those categories but the highest grade the Winnipeg Jets home arena received was for ice quality. Bell MTS Place took home 11.4% of 378 votes ranking third for best ice in the league. Doug Neubauer, Chief Engineer and Ice Operations Manager, says his team always wonders how their sheet measures up against the rest of the league. “We think it’s a great honour to be ranked that high. We love to work on it and make it the best we can. Our whole team deserves a lot of credit and we’re pretty excited that the players recognized us,” says Neubauer. He says his team was thrilled to see the results of the poll, saying it gives them extra drive to make the sheet even better for the players. Neubauer credits the high-quality ice to his team who work tirelessly behind the scenes. “It’s nice to see them recognized,” he added. Winnipeg also received two honourable mentions ranking in the top five for best overall atmosphere and best fans. This is the second year the NHLPA has asked the players to take part in this type of survey. View the complete results at nhlpa.com/player-poll/2018-19.